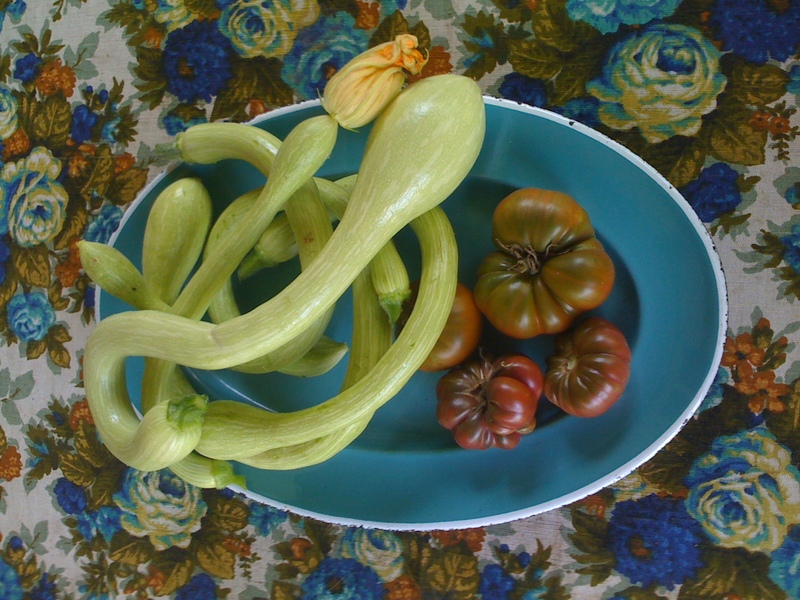 Tromboncino squash- best and most fun veggie this summer! 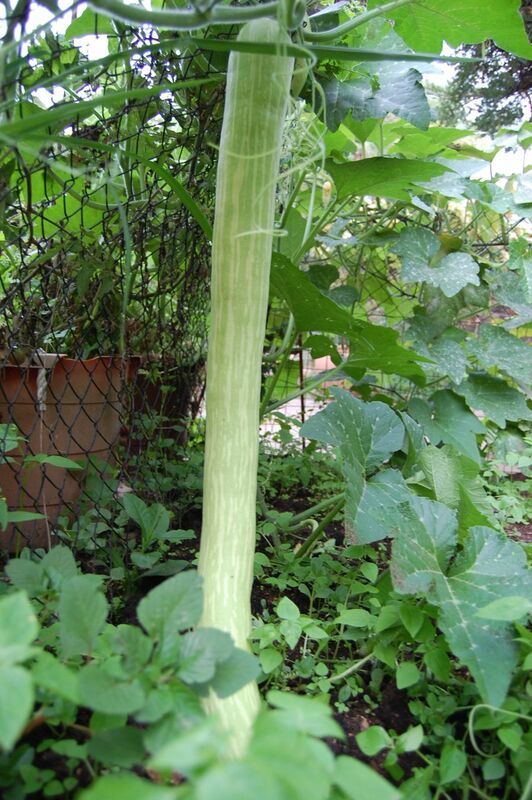 I thought it best to start this post with a photo, as very few of you will have heard of this amazing vegetable. In fact, a photo gallery will tell the story better. 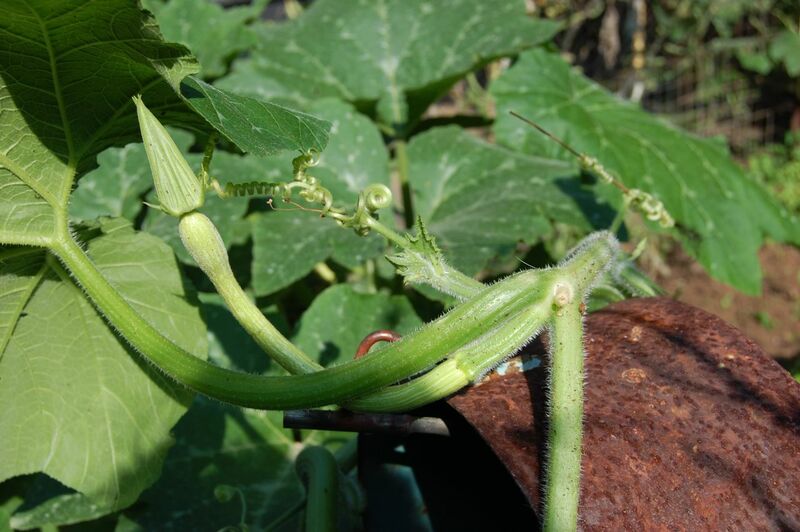 With its Italian names being tromboncino, or little trumpet, and zucchino rampicante, this is baby marrow’s out-of control relative, with even more productive bounty and myriad uses in the kitchen. The fruits are pickable from baby size, but remain crisp and tasty until they are about 40 cm long! 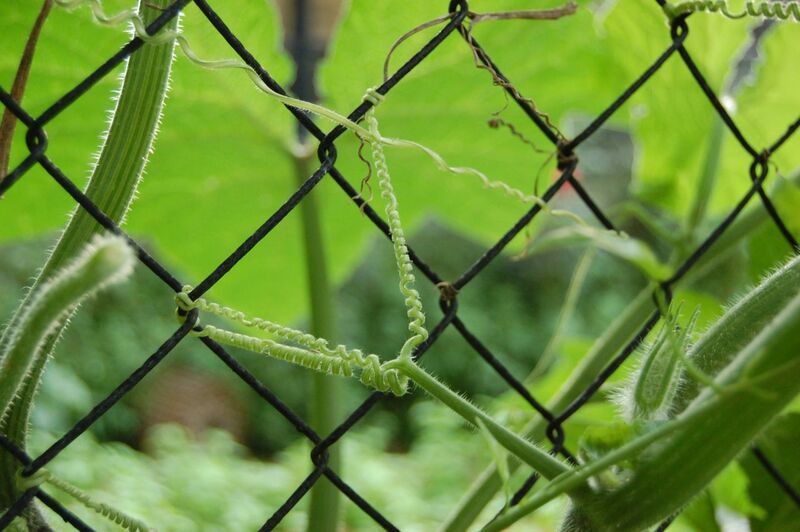 A bonus is the huge crop of squash blossoms, the fashionable darlings of the food world for the last few years. They can be sauteed and folded into omelettes and risotto’s, or stuffed and steamed or deep fried. 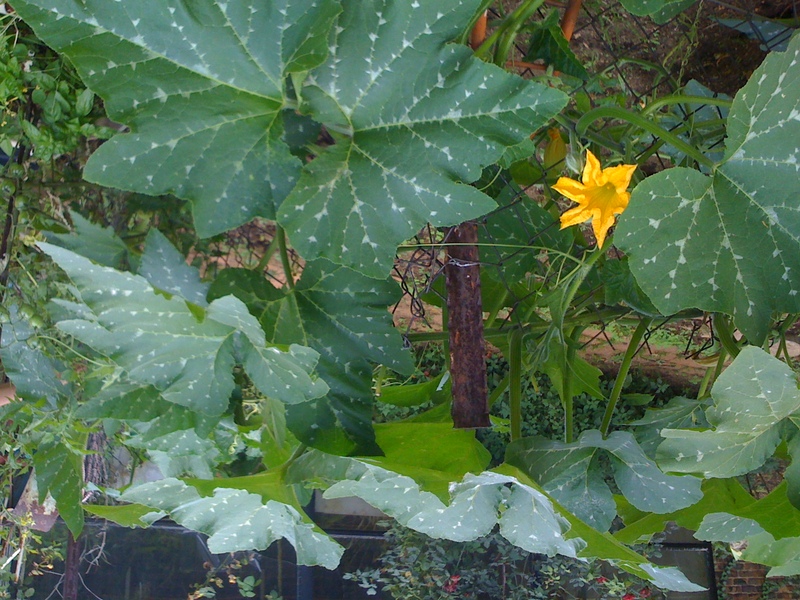 Cooking young pumpkin leaves and tendrils is a well-kept secret of old-timers in Southern Africa. This falls in the morogo/imifino category of traditional foods. Try steaming these delicate bits with a few baby fruits attached and you will be spoilt for life! Combined with onion, potato, tomato, raw peanuts, or au naturel, you will never again want those expensive baby leaves that were flown in from goodness knows where..
More perks: going vertical is a space-saving bonus. 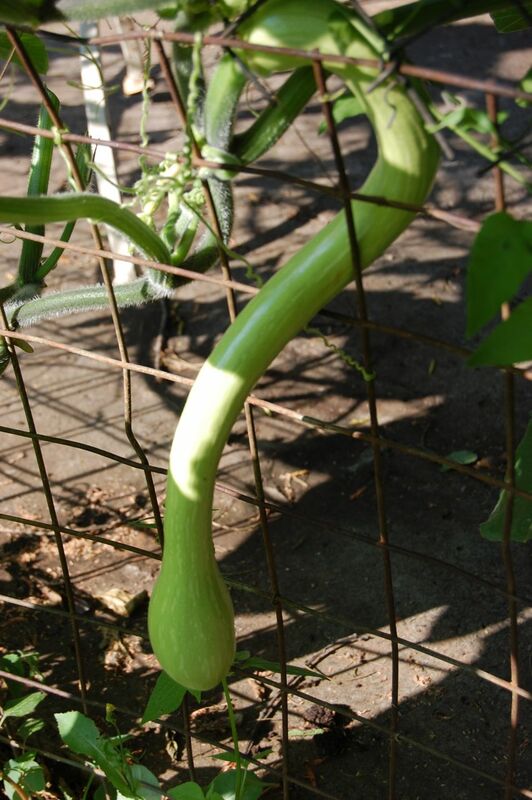 And of course the funny factor as the tromboncino grow into all sorts of fairly rude shapes and squeeze themselves through the fence while growing a few centimetres every day. Kids fall in love with this wow factor instantly and they all want to try and grow one- which is exactly what they should be doing to connect them to where their nutrition is coming from. 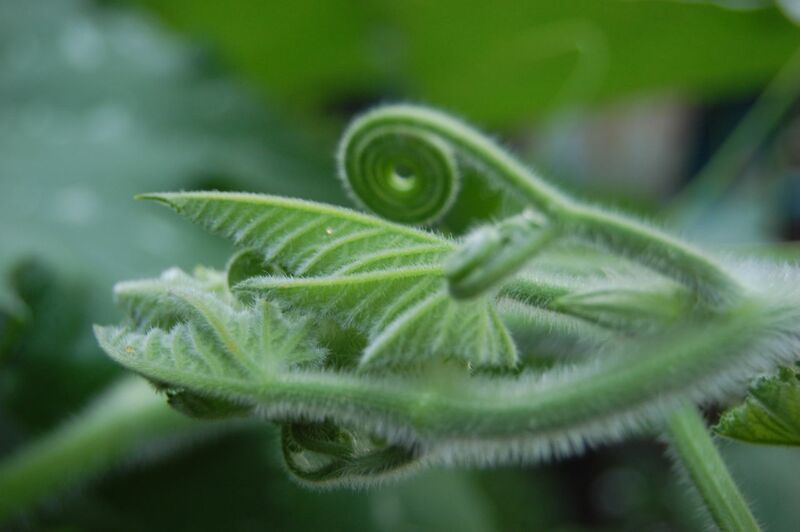 Throughout this very rainy summer, I anxiously watched my only child grow and bear, and tried to snip off every leaf that showed signs of mildew. 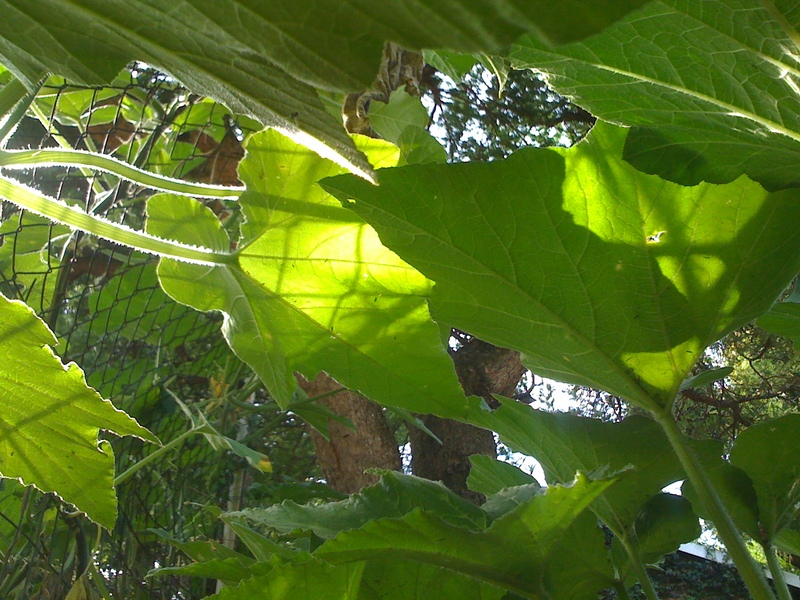 Luckily the pumpkin family have a wonderful habit of outgrowing pests, and I was able to layer a few shoots into new plants in pots to set out elsewhere and share. A few fruits had to be left to mature into monsters in the hope of getting a crop of seeds. The seed cavity is only in the bulbous end and the rest is flesh. Yesterday at last I was able to smash a metre-long freak and extract those sought-after seeds- how very satisfying on more than one level! One of my layered plants will be set out against another fence to try and extend the harvest a bit. Mutsa- if you’re reading this, you can relax and stop peering anxiously through the window to see if I have ‘the stuff’! 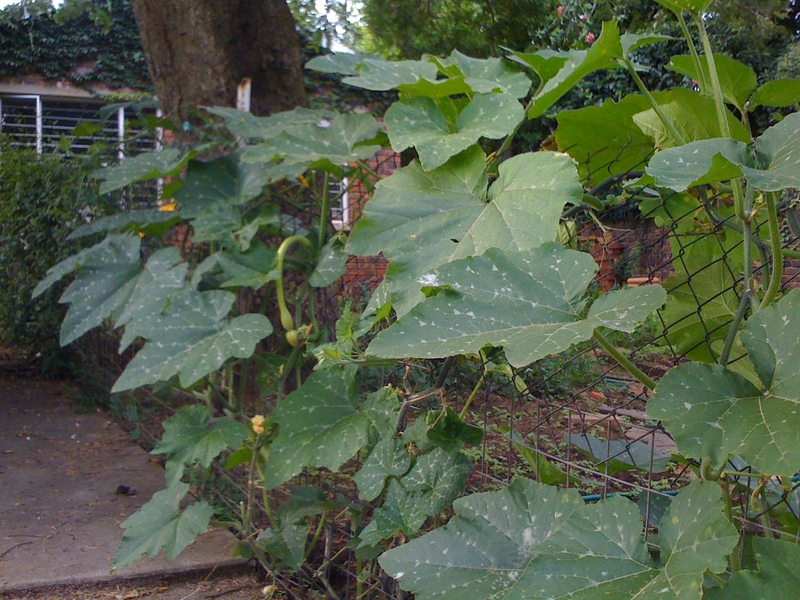 The others will go to market on Saturday and the seeds will be dried and packaged for next spring, and I am already greedily eyeing my swimming-pool fence as a likely spot..
3 tbsp of self-raising flour or more if your mix is too runny. 1. Mix the courgettes, tomatoes, onion and mint in a bowl. Add the eggs and stir the mixture until all the ingredients have combined. 2. Add enough flour to bind the mixture together (add more flour if the mixture is still runny). Season to taste. 3. Heat 1/2 cm of sunflower oil in a shallow frying pan until fairly hot. 4. Spoon dollops of the mixture into the oil and turn the heat down to medium. Cook for 2-3 minutes on each side, until golden. 6. Drain on some kitchen roll or crumpled newspaper and serve hot with tzatziki. Ek lees jou blog, en geniet dit baie – jy moet meer dikwels deponeeer! Hi.,I live in Adelaide,South Australia and have grown Trombonecinis for the first time this year. I dont know where the site is based but here they are a bit tempremental. Often the flowers didnt open and when they did didnt fertilize even when I did it by hand. Then some grew a bit and went yellow. We only got 3 full size ones from one vine. Is this a common problem or is it more suitable for a European climate ? I don’t know what the “Adelaide” climate is like. 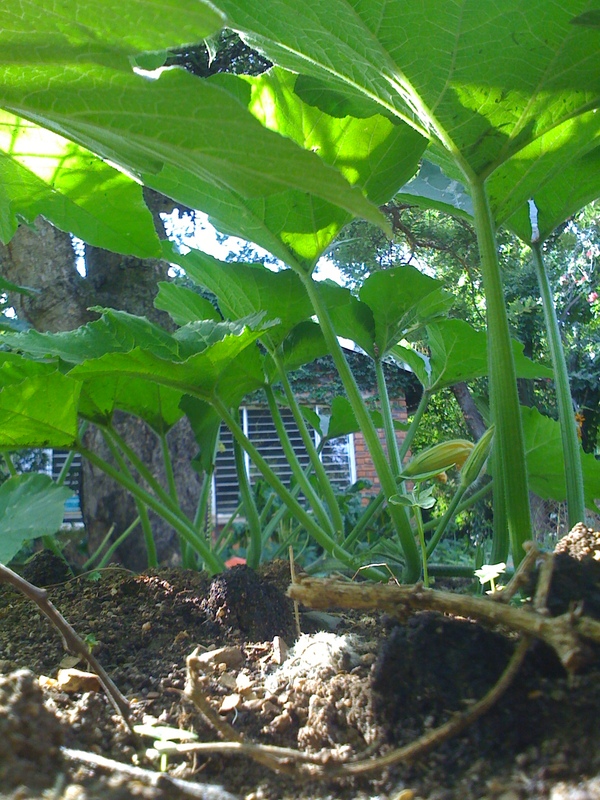 But I’m over in the U.S., near Washington, DC, and the plant grows like crazy in good black soil, with plenty of water. We have summer days as hot as 104F and they love it. 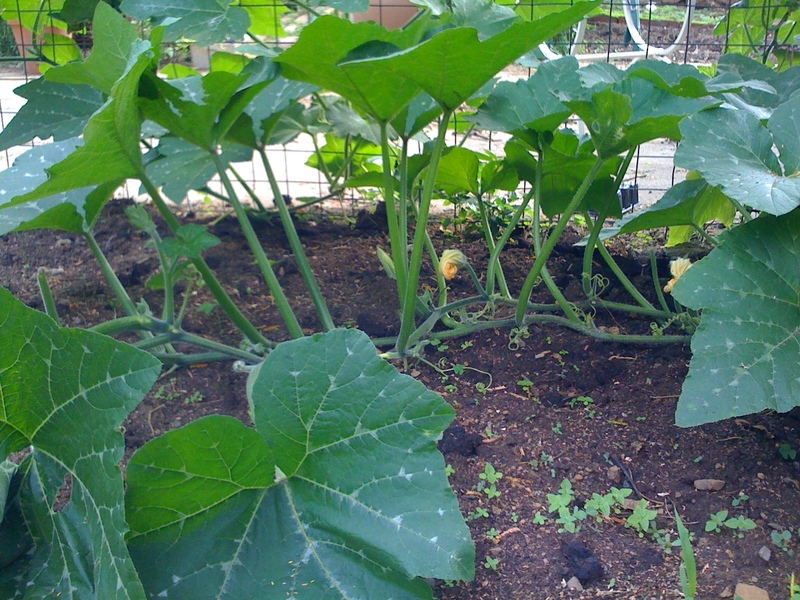 The vines grow to 50 feet or more and outgrow squash borer beetles/worms and every other bug that kills of mere normal summer squash. Some fruits form but turn yellow and die off, but from each plant, I get a half-dozen amazing, trumpet-like fruits. I grate it up and make cakes or slice it and eat it fresh or even cook it in a wonderful summer soup. Try again! 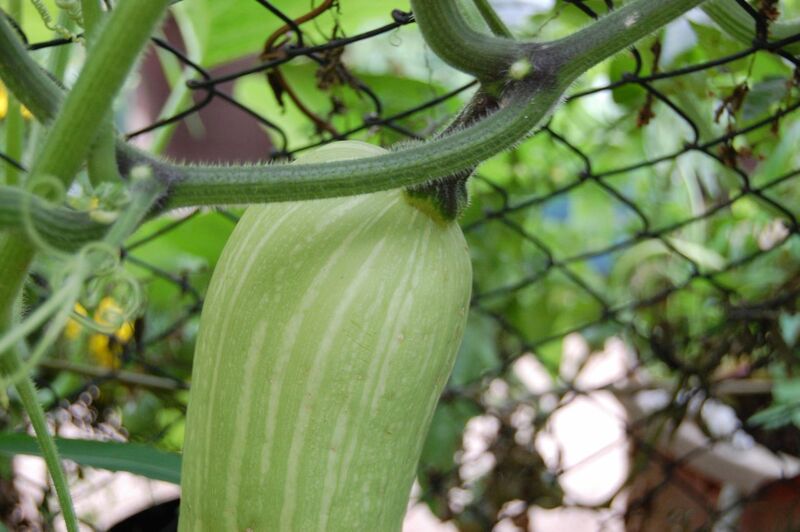 Wil asb weet waar ek van die saad van die Tromonccino Marrow of Tromboncino Squash kan kry en is dit dieselfde groente? gaan. Hulle verkoop baie goeie gehalte saad uit Italië. Have grown them for years now, getting seed from Cook’s Garden. 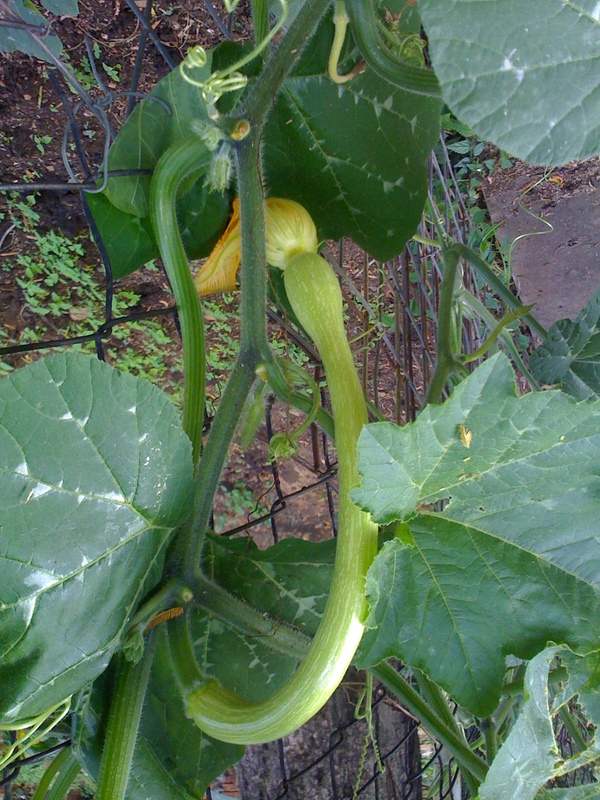 With the seed in the bulb end that long neck is solid squash and entirely useable and tasty. 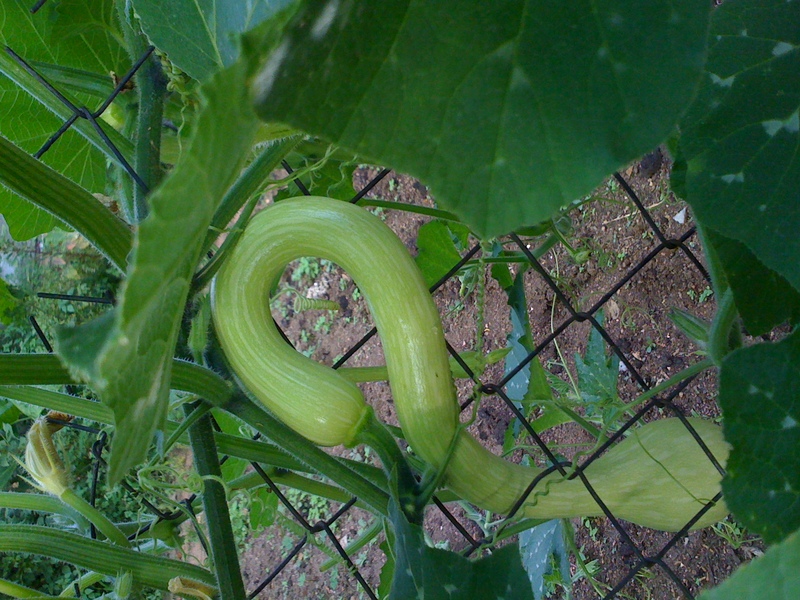 It’s our favorite summer squash. I love these squash, they are soooo amazing! Two of them on the frame of my makeshift greenhouse have at least 15 fruit; they may be more up on the roof of the house I haven’t climbed up there to see yet! Hi Mary, your blog is lovely. 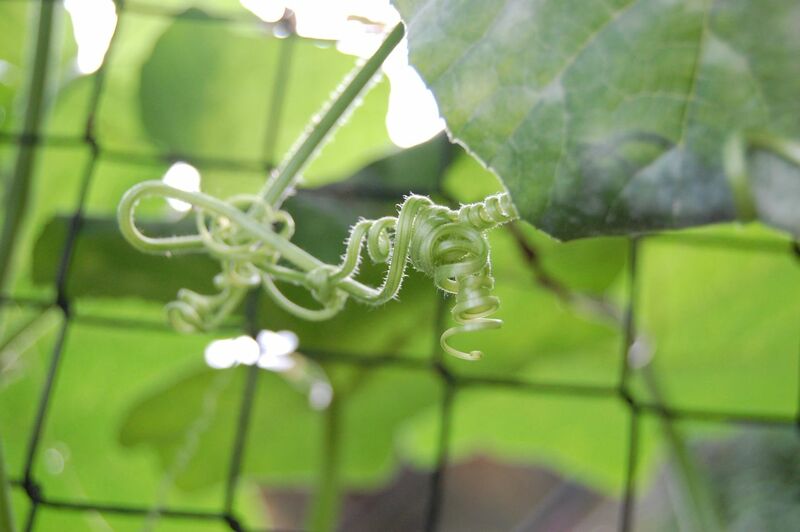 Mine also clambered over my greenhouse last summer and my new seedlings are just coming up as it is spring here in South Africa. 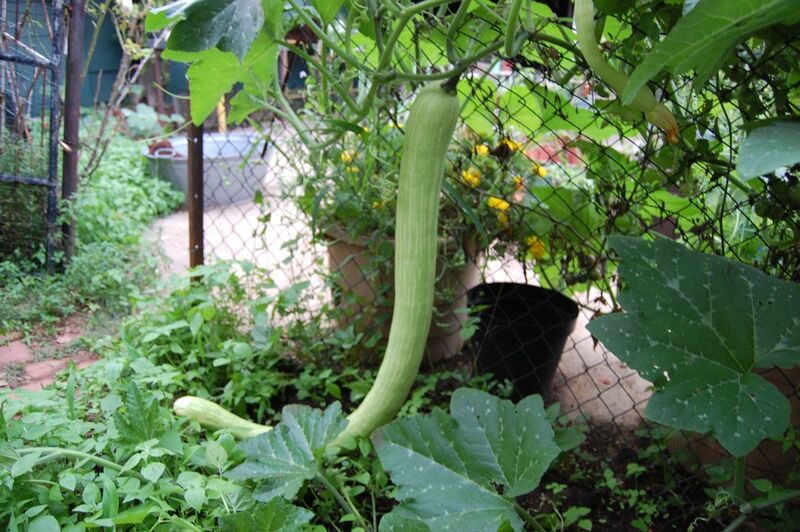 I am also trying yellow crookneck squash which someone sent from the States but I can’t figure out if it’s a bush or a vine? I know it’s very popular over there so I hope we’ll like it. Fantastic looking vegetable. Just saw them on twitter today from Figjamlimecordial. 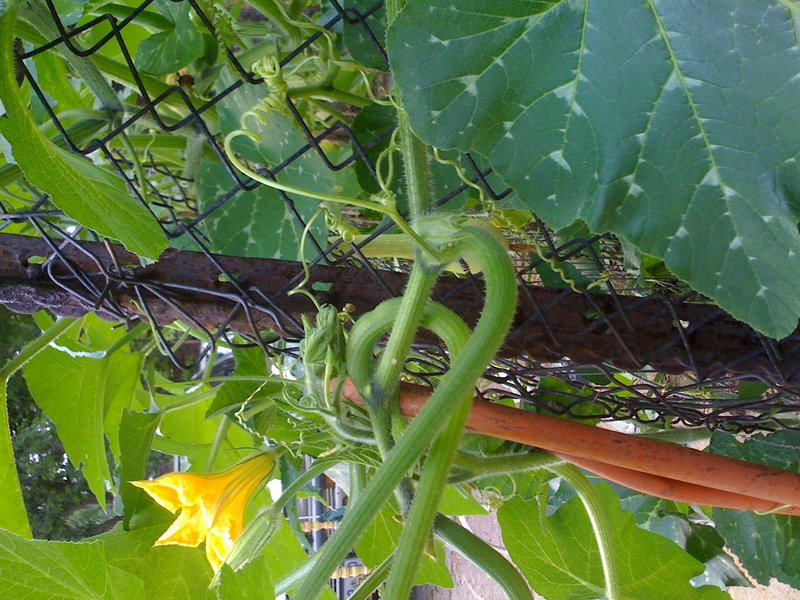 Can’t wait to grow some in our community garden in Newcastle, Oz.